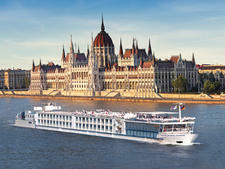 This is another of Travelmarvel's fleet of five stylish European river cruisers. Built in 2006, Travelmarvel Sapphire spans 135 metres, and has a total of 82 accommodations carrying a maximum of 164 passengers. 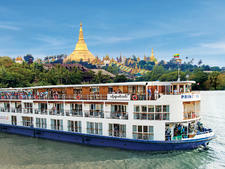 Along with its siblings, Travelmarvel Diamond and Travelmarvel Jewel, Travelmarvel Sapphire cruises the mighty rivers of Europe. The ship's staterooms come in three types, Moselle Window, Danube French Balcony and Rhine French Balcony, with two Owners Suites completing the lineup. The six Moselle Window staterooms are the smallest, at 13.6 square metres, and they are located on the lower Moselle Deck with portholes. 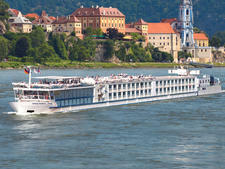 The majority of accommodations are Danube and Rhine French Balcony staterooms, distributed across the middle Danube and upper Rhine Decks, and are slightly larger with 14.3 square metres of floor space, with the bonus of French balconies and floor-to-ceiling sliding doors, which open to provide fresh air and views. Amenities across all categories include a deluxe queen-size bed, a deck and vanity with a hair dryer, minibar and flat-screen TV, a closet with a safe, and a bathroom with a shower. The two Owners Suites are located on the right-hand side of the upper Rhine Deck, and they have 21.6 square metres of floor space. The rooms come with a deluxe queen-size bed, a sitting area, a desk and vanity with a hair dryer, a closet with a safe, a full-size bathroom with a large shower, a flat-screen TV, a minibar, and a combination floor-to-ceiling glass window with a French balcony, which opens. Above the passenger accommodation is a spacious Sun Deck with sun chairs, and like its fleetmates, Sapphire also has a lounge and bar, a dining room, a hair salon and a fitness centre. Travelmarvel passengers are mostly from Australia and New Zealand. 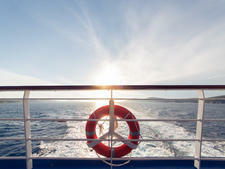 The cruise line offers a comfortable, value-for-money and stylish cruising experience with many inclusions such as most sightseeing tours, fees including tipping and port charges, and complimentary use of bikes and wireless Internet. Coffee and tea is available free of charge day and night, there is bottled water provided daily, and complimentary local beer, wine and soft drinks are served with lunch and dinner. Another perk is Travelmarvel's Insider Experiences, which allow passengers to "live like a local" while gaining insights into a destination's culture and customs, with experiences on offer ranging from enjoying a private Oktoberfest event in Bavaria, to attending a paella cooking demonstration in Spain.